(CelebrityAccess) – Celebrated rock band Third Eye Blind has announced the release of Dopamine, their first album in six years, on Tuesday, June 16. Led by frontman Stephan Jenkins, the album is a road-tested collection of songs chronicling the band's time on tour since their last studio effort, Ursa Major. Employing signature guitar riffs and rock arrangements, Dopamine is vintage Third Eye Blind – a body of work whose songwriting details the personal relationships that have come and gone and the rapidly changing world we live in. A lot can change in six years, and while the sound has progressed, the recordings retain the endearing sentiment Third Eye Blind fans new and old have come to love. Stream the first single from Dopamine titled "Everything Is Easy." 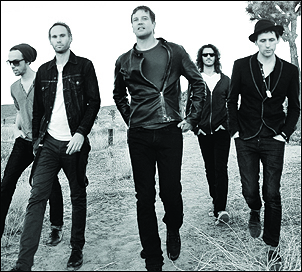 Third Eye Blind have toured relentlessly over the past few years including huge appearances at music festivals across the globe. This summer will mark a return to amphitheaters and stadiums when the band embarks on an eight-week national tour with Dashboard Confessional. Third Eye Blind gained wide success at the end of the recording industry golden age. Their endurance and ability to adapt through the digital revolution speaks to the ingenuity and creativity found in the music. After four smash albums and millions of records sold worldwide, they continue to write, record and tour, entertaining their core audience while growing a larger, younger and more dedicated fanbase than ever.The band now work and communicate in a fluid new world where their music continues naturally to evolve. Their exchange with their audience is unfiltered, and being from the hub of the digital space, they are using it to develop a closer exchange with their audience, which will continue to flourish with the upcoming release of Dopamine. Third Eye Blind will be touring North America in support of Dopamine as well as performing a number of hits from its expansive back catalog this summer with Dashboard Confessional supporting.